Pianoscales.org is a free resource and will continue to be so. However, if you feel that what you get from the site in some degree can be compared to what you would get from a book or a teacher, you could choose to support the site. If some of the visitors would decide to contribute with $1 or more per month, it would make a great difference. More time could be invested on the site and more creation projects could be fulfilled. Becoming a member will in return give you access to exclusive material. 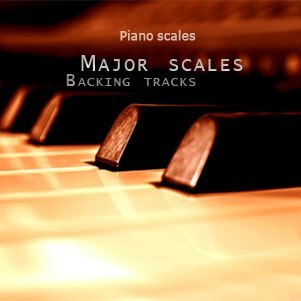 This month, the Major Scales Backing Tracks album has been added to the member area. Backing tracks is music arrangements that can be used for exercise scales or improvise to. On the Major Scales Backing Tracks album, the instrumental tracks are made specially to be use with the major scales. 17 tracks, one for every scale, with the piano parts removed, which is for you to play. Instructions are given for which scales to use for matching the music (no key changes occurs in the songs). In addition, you get access to new created exclusive material on your member page. 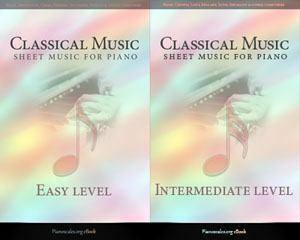 This month, the Classical Music Easy Level eBook has been added to the member area. Support the site with $3 per month and, in addition to the above, get the Classical Music Easy Level eBook with Sheet Music. The collection of sheet music includes piano pieces from famous composers such as Johann Sebastian Bach, Ludwig van Beethoven, Robert Schumann, Edvard Grieg, Georg Friedrich Händel and Antonio Vivaldi. Each of the piano pieces are well-recognizable with arrangements for beginners. The book contains advice and explanations about how to play all piano pieces. It also has biographies of the composers. After you have become a member, a link to your member page on Pianoscales.org will be sent to your e-mail. On your member page is all the exclusive material collected and can be downloaded as well. Since Mars 25, 2019, Pianoscales.org has a Patreon.com profile page. This is a way for website creators to get support to develop their projects and for visitors to engage in them more directly. For now, the best way for a patron subscribe to a creator with a one-time payment is to become a patron then simply cancel their membership after they have been successfully billed. This is the best method for a one-time support, although it's not perfectly smooth, as you can read. Since you are helping Pianoscales.org it is very important that you don’t suffer from your engagement and that you should be able to stop your economic support as smooth as it was for you to start it. Go to the menu on your Patreon page and click on “My memberships”. On the page that open click on “Edit”. Finally, “Click on Edit or Cancel Payment”. If you still have questions about this or problems by finding the cancelling steps, be welcome to contact the site owner on info@pianoscales.org. You could also contact Patreon.com (which is the third-party service Pianoscales.org use for this membership/support approach), on the contact form found via this link: Patreon contact page.